In search of the bushplanes of North America, I made a roadtrip through Northwest Ontario. I did not get to fly in any, as the season had all but closed down. Maybe next time. The good thing was I found most planes at home. 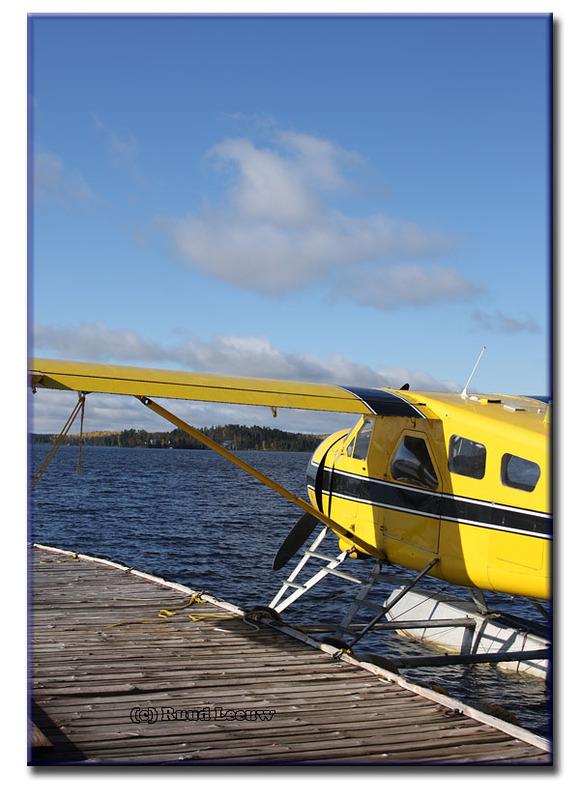 That morning we had left Sioux Lookout and we visited Savant Lake (links at bottom page). 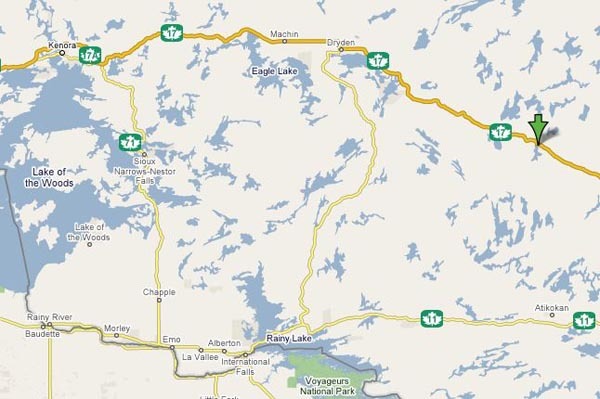 We continued to Ignace, drove most of the afternoon in rain or drizzle. Discouraged by the weather and with hopes for better weather the next day, we decided to call it a day at 3 pm. We spent the night in a disappointing motel, North Woods Motor Lodge. I had hoped to go online but a problamatic internet connection proved to be one of many disappointments of that motel. Murray Brookes wrote me in nov.2014, perhaps someone could deny or support below details? "I noticed you have photos of Beechcraft 18 CF-WUH. 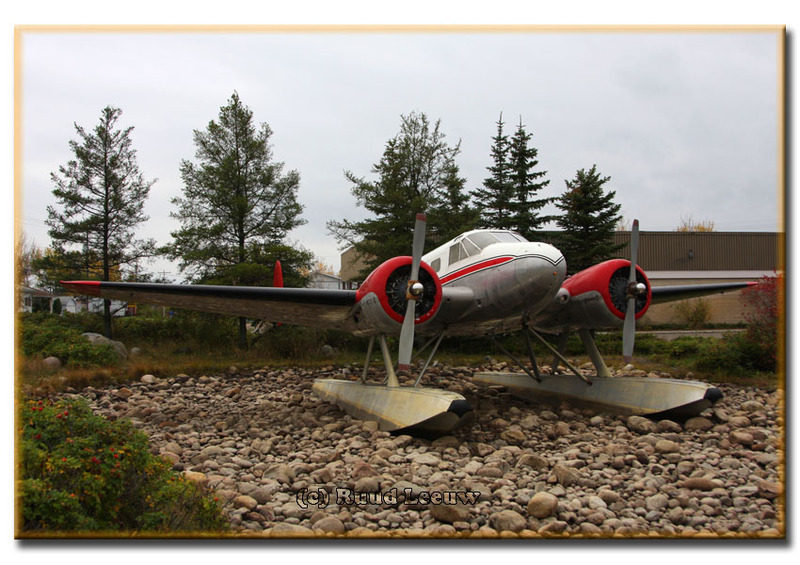 I believe this aircraft was at one time owned by Vern Billar/Cree Lake Lodge at either Indian Head Saskatchewan or Cree Lake Saskatchewan. He ran a lodge up at Cree Lake. 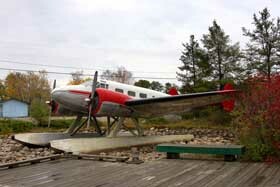 The aircraft was stored at Indian Head at off-season. It was involved in a landing accident at Indian Head about the fall on 1978 or 1979. I understand the aircraft was landing at a unlighted strip east of town late into the evening. An automobile was used to high light the strip with its headlights! There was some miscommunication between the automobile and the aircraft pilot... The pilot landed the aircraft beside the grass runway in a plowed field. Unfortunately the aircraft suffered severe damage to the landing gear and would likely never fly again. I had heard that it was shipped the Thunder Bay shortly after this incident. And I believe the pilot at the time was Ben Hewson but, he has since passed. The airport changed hands and is no longer on the registry for active airports. I believe it was listed as JP4 and is now not used. I was inside the aircraft while stored off season prior to the crash. The interior was very similar to the way the RCAF kept its Expeditors. I hope that this info was correct." 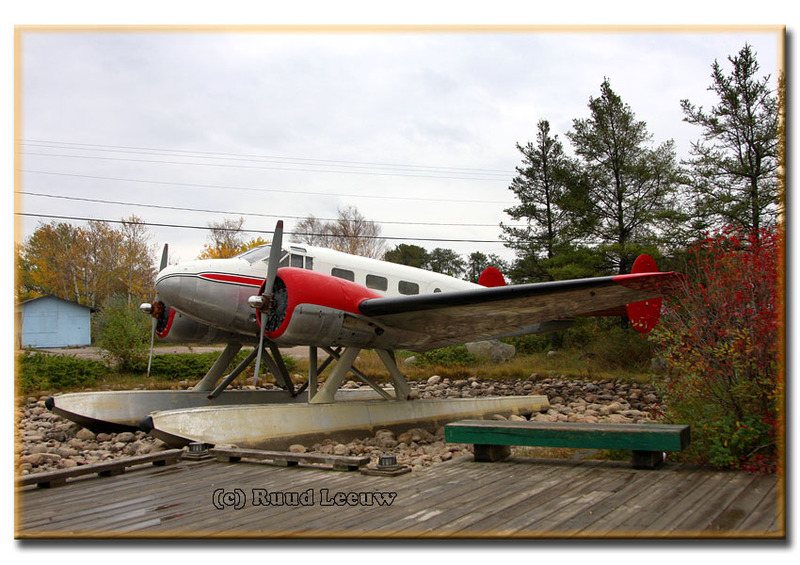 Bob Parmerter, author of the authorative book: Beech 18: a Civil & Military History, commented on the history of this Beech 18 c/n A-872 / CA-222 3NM RCAF serial 2343. TOC by Maritime Group (Maritime Air Command) 60Dec52. Storage at No. 6 Repair Depot on 04Apr1957. To Air Defence Command on 06Aug58, for use by No. 400 Squadron (Auxiliary) at RCAF Station Downsview, Ont. Still with this unit when it transferred to Air Transport Command on 30Sep58. Re-designated as Mk. 3NMT(Spec) on 08Jan1960. To Bristol Aerospace in Winnipeg for overhaul, 04Aug - 14Nov60, then back to No. 400 Squadron. Operated by No. 412 (T) Squadron at RCAF Station Uplands, Ont. when it carried A/C Birchall from Trenton to Ottawa on 11June1961. Inactive reserve with No. 1005 Technical Storage Detachment at Saskatoon on 31Oct66. Pending disposal there from 7Apr67. CADC sold to Western Aero Renters Ltd, Edmonton,Alb. 06Nov67. Gateway Aviation of Edmonton,Alb reg’d Aug68 as CF-WUH. Funtastic Enterprises,BC (CCAR 75, 76). Clarence & Vern Biller of Strasbourg,Sask (CCAR 77, Jun82). Accident on 29May81 at Indian Head (Saskatoon) when the landing gear collapsed on landing. Pilot was not current in type and improperly performed emergency crank down of under carriage on a ferry flight. No injuries. 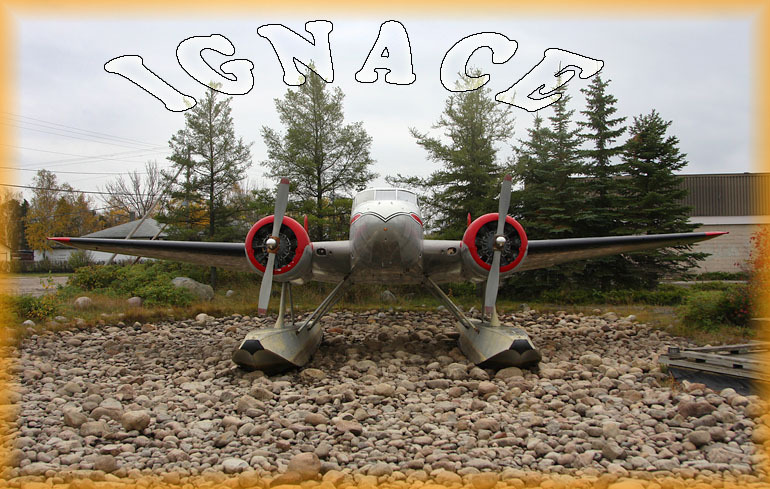 Restored on false floats by Ken Rosche and Rich Hulina for static display in May95 in Ignace Plaza pond in Ignace along Trans Canada Hwy. Still there in 2009. As one can see the details of the accident at Indian Head do not confirm what Murray wrote, but do not exclude it either. It does look nicer with water in the pond, more true to its element! "It was t/o/s by the RCAF on 20Nov52 and received (some documents said "delivered") on 08Jan53. I believe that the discrepancy with Bob0s "TOC" date is that 20Nov52 was the date on which it entered the RCAF's inventory system as an accountable item, making it officially belonging to the RCAF as of that date. I am not 100% certain, but I think the 06Dec52 date is when it was allocated on paper to be assigned to its first unit. Understandably, such allocations occurred in advance of the arrival of the aircraft so they knew where to send it. Then it was actually, physically received/delivered on 08Jan53. It was s/o/s by the RCAF on 07Apr67 and went to CADC (Crown Assets Disposal Corporation, a government agency) on 06Nov67." This Beech Expeditor does not sit in a river or a lake, but rather in a garden-shaped pond... without any water! It sits on the Trans Canada Highway through town, next to a modest shopping plaza. It does not carry a registration nor any markings, but seems to be in pretty good shape. One can see the remarkable difference in weather, from one day to the next. The Beechcraft Model 18, or "Twin Beech", as it was better known, is a 6-11 place, twin-engine, low-wing, conventional-gear aircraft that was manufactured by the Beech Aircraft Corporation of Wichita, Kansas. By the late 1930s, the winds of war had blown across Europe. Beechcraft management knew the company would be called upon to help the allied cause and they bet the future on increased production facilities and a new design dubbed the Model 18. The design was mainly conventional for the time, including twin radial engines, all-metal semi-monocoque construction with fabric covered control surfaces and "taildragger" undercarriage, while less common were the twin tail fins. Early production aircraft were either powered by two 300 hp (225 kW) Jacobs L6s or 260kW (350hp) Wright R-760Es. The 450 hp (295 kW) Pratt & Whitney Wasp Junior became the definitive engine from the prewar C18S onwards. Construction of the Beechcraft Model 18 ended in 1970 with the last Model 18 built going to Japan Airlines. Beechcraft set a record that still stands today for longest continuous production of a piston engine aircraft. Through the years, 32 variations of the basic design had flown, over 200 improvement modification kits were developed, and almost 8,000 aircraft had been built. It has been on display here since 1994, but I would appreciate if someone could relate its operational history to me. 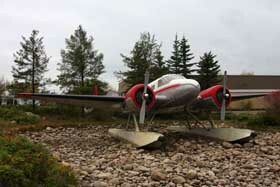 'The aircraft was built from parts of three planes and erected here on false floats in 1995, the work being done by Ken Rosche and Richard Hulina. 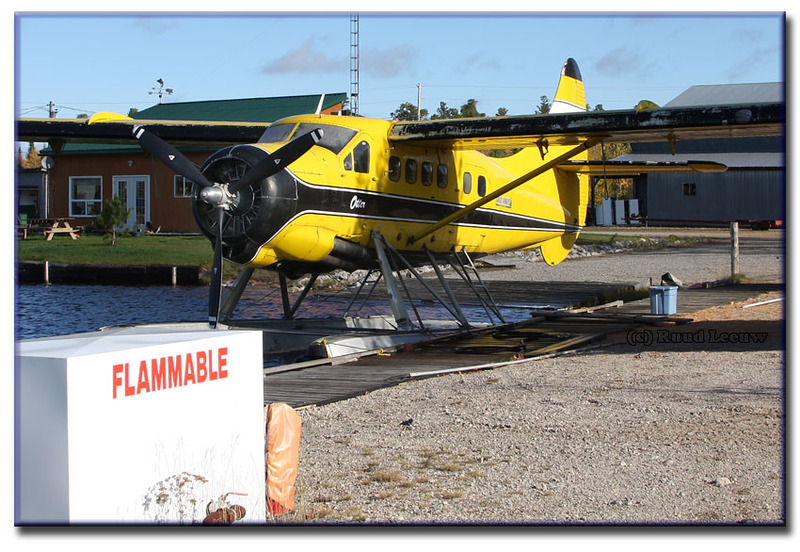 Next we went to the Seaplane base of Ignace, on the outskirts of town heading west on the Trans Canada Highway. What a splendid weather! C-GZBR started its career with delivery on 30Oct58, with tailnumber 57-6167, to the USAF. Type designation L-20. Its military career over, it was stored at Davis Monthan AFB in Arizona for the period 21Jun72 to 13May75. A civilian career got under way for this Beaver as N47032 when it went to a school in Grand Rapids,MI but as yet I have no date of this event. 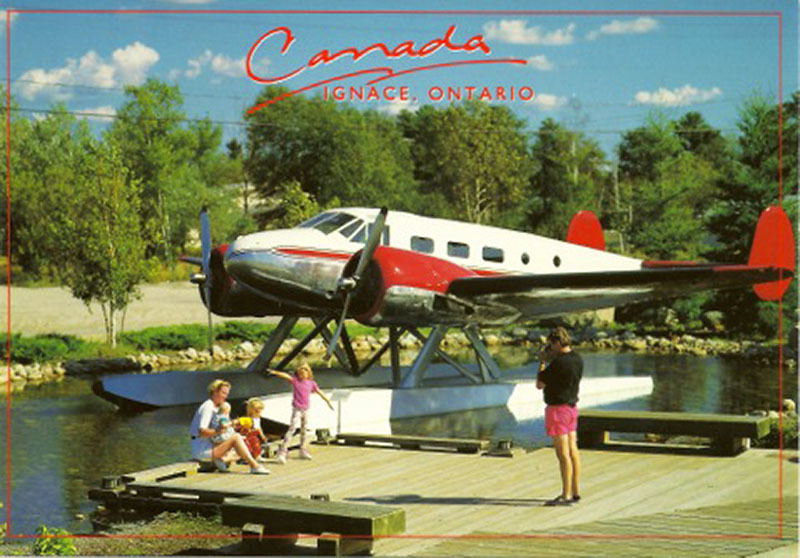 It was imported to Canada in 1978 and was registered as C-GZBR for Ignace Airways Ltd, Ignace,ONT. on 29Apr88. JP Airline Fleets (2007) quotes a previous identity, before C-GZBR, as N434GR. 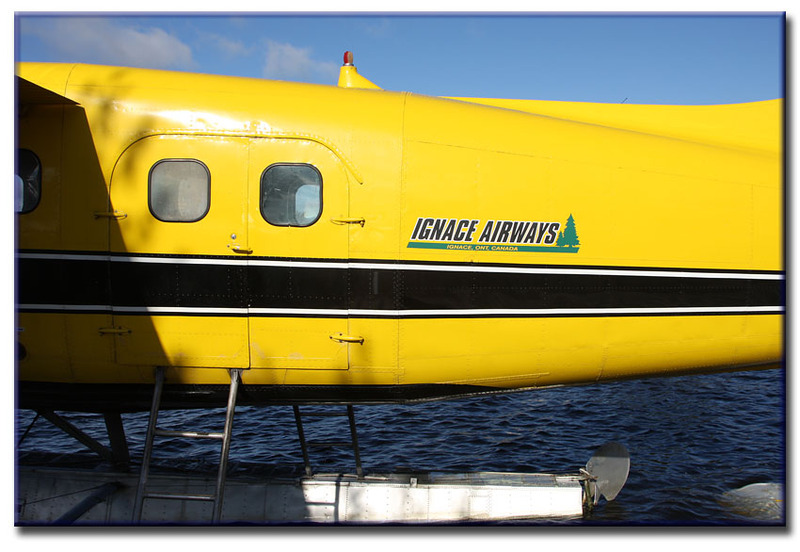 The fleet of Ignace Airways consists of 3 aircraft: DHC-2 C-GZBR, DHC-3 C-FAPR and Cessna U206C Super Skywagon CF-TTL. The latter was in repairs somewhere, in a hangar, had some damage to it. DHC-3 Otter construction number 31 was the last of the first batch of six of ten DHC-3 delivered to the Royal Norwegian Air Force. The batch of six were delivered in crates by ship and formally handed over on 2nd March 1954. This Otter took serial 5331 and code O-AG. The Otter originally joined the Communications Flight at Jarlsberg Air Base in July '54, moving to Gardermoen Air Base in November '54. In May 1955 it joined the Communications Flight at Bodo Air Base in northern Norway. C/n 31 was also deployed to the Antarctic on "Operation Penguin" from Oct1958 until Mar59. After its exploits in the Antarctic, it was reassembled at the Horten Marine Base and joined 7192 Stotteving (Support Flight) at Orland Air Base in May 1959. Its military career came to an end in june 1967 and it was struck off charge, having flown 4,177 hours in Air Force service. As with all the other Royal Norwegian Air Force Otters, it was handed over to Halle & Peterson, Oslo the DHC agents in Norway for disposal. 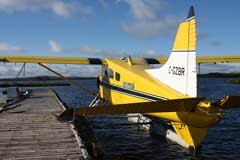 The Otter was sold to Wideroes Flyveselskap A/S to whom it was registered LN-LMM on 22nd June '67. For the next four years, the Otter flew on Wideroes scheduled services linking the remote communities of northern Norway, until replaced by the Twin Otter. 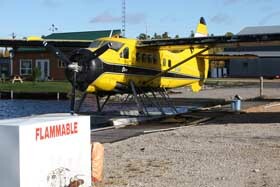 LN-LMM was one of the last three Otters flown by Wideroes, all three of which were sold to Laurentian Air Services Ltd of Ottawa. LN-LMM became CF-APR. By this stage of its career, LN-LMM's total airframe time had risen to 8,150 hours. The Bill of Sale for all three aircraft is dated 19th October 1971. The three Otters were shipped back to Canada and re-assembled at Laurentian's Ottawa base. 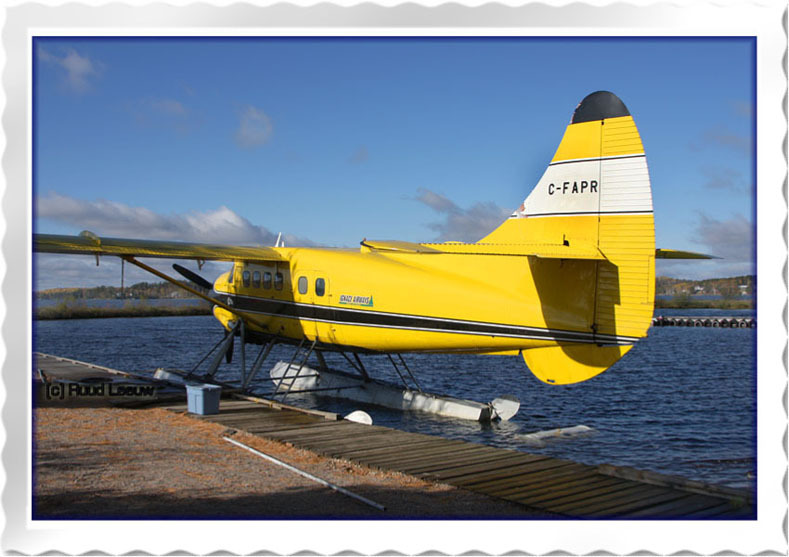 All three Otters entered service with Laurentian Air Services, which was a large operator of the DHC-3. 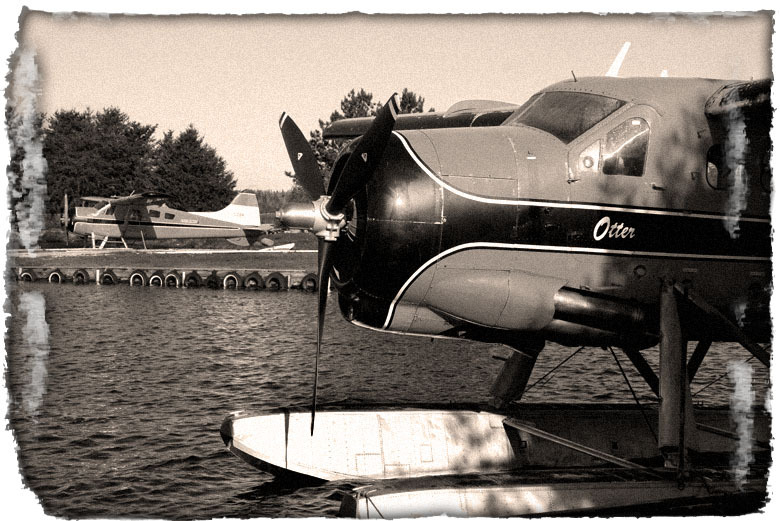 Over the years, it operated 14 Otters. 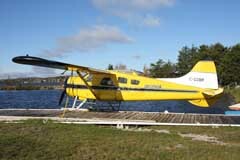 Although based at Ottawa, most of the company's flying was done in Quebec and Labrador. 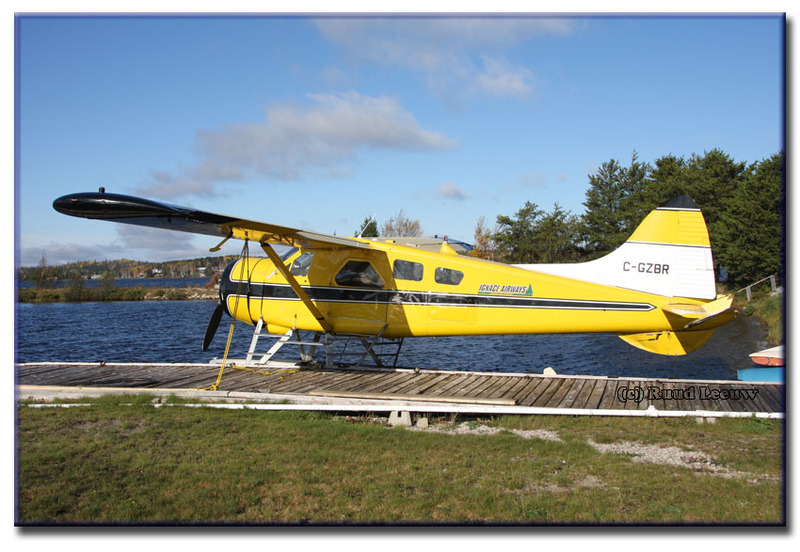 CF-APR continued in service with Laurentian until sold in 1977 to Bearskin Lake Air Services Ltd of Big Trout Lake, Ontario, the registration by that stage having been changed to C-FAPR. 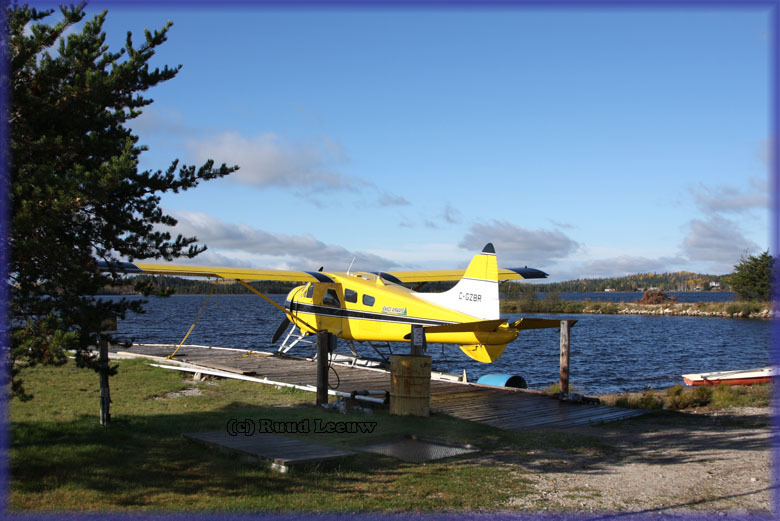 It was to fly for this operator for the next 8 years, one incident being recorded, on 19th December 1979 at the aircraft's base at Big Trout Lake, where the outside air temperature was a sharp -20C. An extract from the report: "Prior to commencing take-off from the ice strip, the pilot selected an abort point. On take-off the aircraft passed the selected point, but the pilot continued, thinking that the aircraft would soon lift off. The Otter did become airborne but the gear struck a pile of snow. The pilot continued and landed at a land strip to inspect the damage". 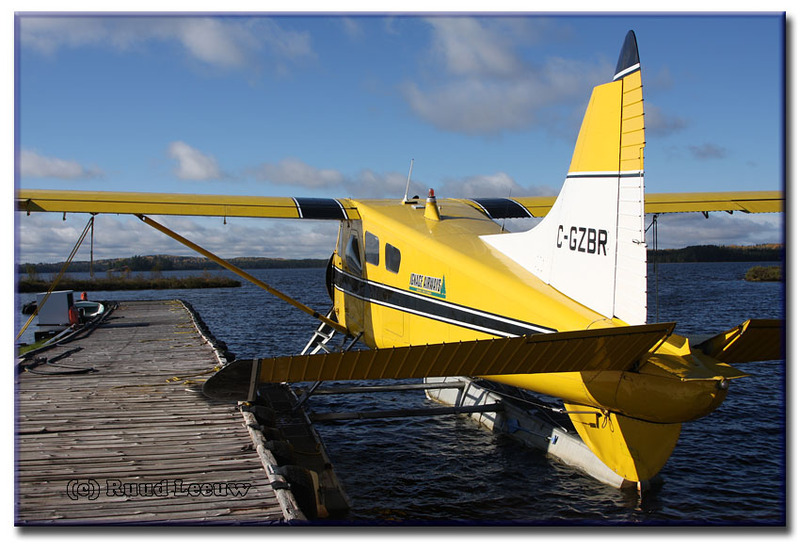 .In April 1988 the Otter was sold to Ignace Airways Ltd of Ignace, Ontario, being re-registered in August 1996 to Ignace Airways (1996) Ltd.
C-FAPR supports fly-in fishing camps during the summer months. 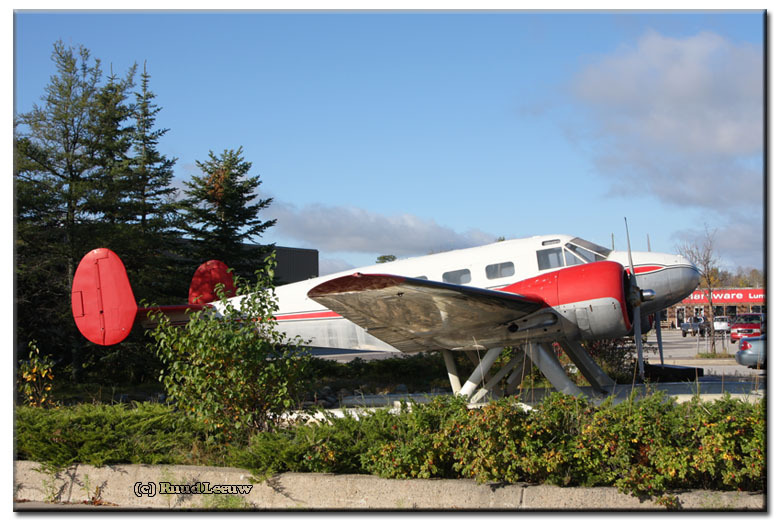 Next we went to the airport of Ignace, further out of town heading west on the Trans Canada Highway. According to my information there are/were a few surviving Noorduyn Norseman airframes at/near the airport, someone is working on. See one on Airliners. net by Alain Rioux. So I drove up there and came to a 3-way junction: the one on the right was a closed gate to the airport, the one in the middle was a pad-locked gate and the one on the left was a dirtroad, which we followed for 30 minutes but led to nowhere. My bet is on the signposted, pad-locked gate. Norseman C-FKAS is unique in a way that its linnen fabric cover was replaced by aluminum sheetmetal. 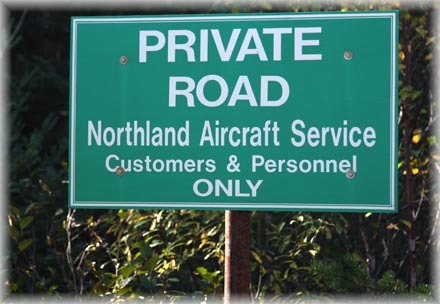 Of CF-CRC is little left; after an accident in 1986 it was acquired by the owner of Northland Aircraft Service Ltd, Gordon Hughes, for spares supply his own Norseman, CF-DTL. Mr Hughes had 3 more Norseman frames but those remained unidentified. CF-FOX was restored during 2009, for photos by Rich Hulina see Photo by Friends & Guest PAGE 17 and PAGE 22. 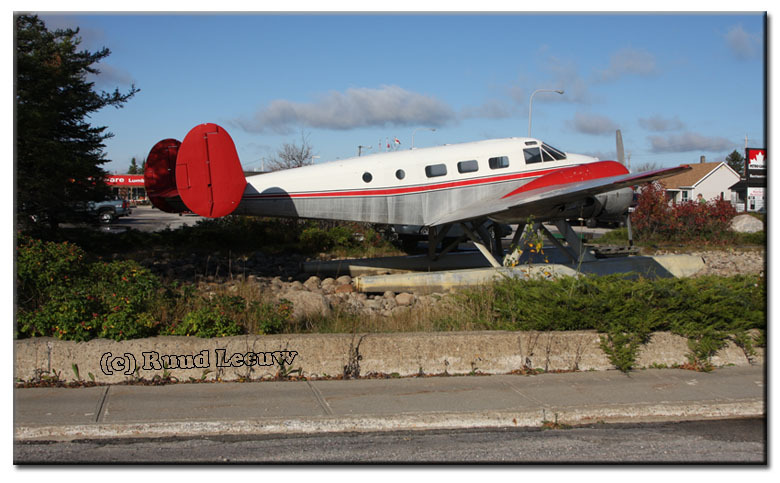 In Oct.2016 I found reference that CF-GSR had gone to the Canadian Warplane Heritage Museum of Mount Hope,ONT. 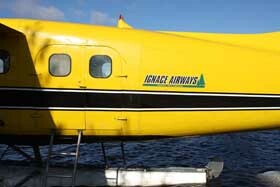 Thanks to Ignace Airways for their kind hospitality.